As a horticulturist, landscape designer, and Florida-friendly expert, I love to help design, teach, and encourage clients that they can have not only a beautiful garden but a sustainable, water-conserving, low-maintenance yard. 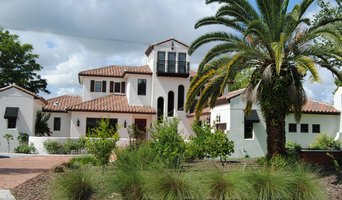 In 2001, I designed the landscaping for the first home in Florida to be certified as a "green home." In 2002, Garden Gate magazine featured my quote “Every garden is unique with a multitude of choices in soils, plants and themes. Finding your garden theme is as easy as seeing what brings a smile to your face” on the magazine's back cover. Continuing my ten years teaching with the University of Florida Extension Florida Yards & Neighborhoods, I work with and advise cities, counties, water management districts, home owner associations, custom builders and developers on Florida-friendly landscaping practices while following my heart’s desire of designing landscapes for private clients that are easy to maintain, water-conserving, and protect Florida’s precious resources. When not putting my hands in a client’s backyard, you can find me digging in my own garden, looking for slugs and lubber grasshoppers ~ creatures, that I swear, do not have souls ~ aided in that effort by MacTavish, our legendary Scottish Westie lubber hunter. 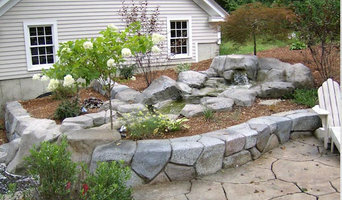 My landscape designs are uniquely infused with genuine enthusiasm and expert knowledge of Florida-friendly landscaping. Let me know how I can inspire you with your own unique landscape that will be your own personal sanctuary. Please call me so we can meet and get started on the landscape of your dreams. "Who designed your landscape?" "SHE did!" 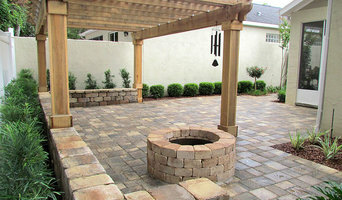 Native Sun Outdoor is a well-established full service Landscape and Hardscaping company rooted in the heart of central Florida. With background service as an U.S Marine, founder Phil Waesche and a small group of veterans from multiple military branches set out with a vision to establish a competitive landscaping service offering the highest standards of customer service. Today, Native Sun Outdoor has grasped that vision and transformed into one of Central Florida’s leaders in creative landscape design, especially in hardscape. With unique concepts, creativity, and passion, Native Sun Outdoor has established a visionary breakthrough in endless decorative concrete features unmatched by any competitors in the industry. From water features, Summer Kitchens, concrete counter tops, vertical hand carved concrete, and specialty overlays, Native Sun Outdoor is capable of sculpting concrete into just about anything you can imagine. With diligent hard work and a commitment to our customers, Native Sun continues to grow by honoring its core values and remembering its humbling beginnings. If you have any landscaping, painting, Flooring installation, and fence installation needs that you want to be solved immediately, professionally, and effectively, then hire Jasper Services! We will be happy to serve you. And rest assured you will be happy too! Family owned business Adam and Jesus Melendez are the proud owners of AJ Fence Inc. since 2004. We have over twelve years experience in custom built fencing. We strive for customer satisfaction. One of our main goals is to provide high quality, durable, and low maintenance fencing at an affordable price for all of our customers. Our company is license and insured and provides competitive prices. All of our fences are custom built with high quality products. Manufactured life-time limited warranty on all vinyl and aluminum fence materials. We are a locally owned family business located in Lakeland, Florida. We have provided fence installations for family’s through-out Polk and Hillsborough counties. Created with over 25 years of landscaping expertise, Prestige Landscaping Service strives to constantly raise the standards of Lawn Care and eco-friendly services. This ensures a product that is pristine, convenient and environmentally conscious. We provide a wide range of services designed to enhance client’s investments including high-end commercial and residential lawn maintenance, hardscaping, tree trimming, irrigation, sod, plants, trees, mulch and more. Our communication and customer service is second to none, as we realize without our customers we have nothing. We assign client representatives who are available most any reasonable time to answer any questions, give suggestions or provide quotes. Simply put, we take pride in our detail, care and experience so we may exceed expectations and accomplish the task at hand to the best of our combined abilities. We offer specials in the form of monthly deals and financial flexibility. We have a long-standing promotion where your first cut is on us! Our online fence store provide high quality vinyl fence, vinyl fencing, vinyl fence panels, vinyl fence styles, vinyl fence gates, vinyl fence posts at the most competitive prices. We are located in 5 locations Orlando, Oviedo, Tampa, Port Richey and North Port all ready to serve you. For more information please call on our Toll Free (866) 651-3633 number or visit our website www.fenceoutletonline.com. If there's one place a child should feel safe, it's at home! Our goal at Central Florida Pool Fence is to protect every home that has a swimming pool. Besides your supervision, pool safety fencing is the most important layer of protection between your child and your pool. Central Florida Pool Fence and Life Saver Pool Fence is a removable mesh pool fence designed specifically to provide a safety barrier around residential swimming pools for toddlers and young children. The fence is installed in sections to provide convenience for easy removal and reinstallation by you, the homeowner. Our standard product is Black Safety Mesh, 4 feet (48 inches) high, utilizing reinforced standard aluminum support poles. This model fence is manufactured with an industry standard of 36 inches between support poles. It is our standard and most popular model of fence. The 4 foot height is used as the standard for US Consumer Product Safety Commission recommendations for pool safety fencing. It is also the height required by most states and counties that have passed laws requiring pool isolation barriers for child safety. The System Our tension based system utilizes a series of 15 foot sections of fence with inserts for mounting in non-conducting polypropylene sleeves core drilled 4 inches deep into a concrete deck or other substantial surface, The fence remains sturdy by tension supplied from reinforced aluminum poles that slip into your deck. Mesh Life Saver pool fence is constructed with Textilene® polyester mesh fabric utilizing a mildew resistant polyvinyl coating that provides years of use in the harshest sunlight and the most extreme winter. It’s woven with a continuous basket weave that boasts an incredible tensile strength rating making it impossible to rip under normal use. Bordered on all four sides by a reinforced vinyl material, the fence is kept from sagging and the necessary tension is maintained throughout at the top and bottom. The finished mesh is securely mounted on reinforced aluminum poles and reinforced with aluminum cove molding strips attached to each pole. Pelican Fence LLC is a leading Fence Contractor in the Clermont, Winter Garden and Orlando areas with over 25 years experience. We provide our clients with a comprehensive approach and direction with designing and building their fenced in backyard or commercial spaces. Our family of fence professionals offer value with our honest principles, highest quality fence installations and warrantied projects. Heavenly Landscaping & Lawn provides complete residential and commercial landscaping solutions for property owners and managers. Our company provides personalized attention, creativity, and quality workmanship. 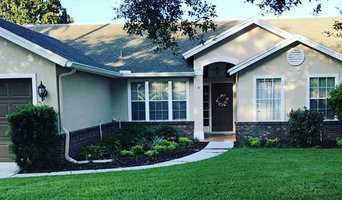 Our Orlando, Florida based landscaping company is fully licensed and insured.If you choose us, you will be as happy as thecustomers in our consistent 5-Star reviews on Thumbtack! Established in 1958. AAA Fence Company is Family & Veteran owned. AAA Fence Company is a full-service fence dealer and contractor. We are able to fulfill any fencing need, residential or commercial, throughout the central Florida area. Since 1958, AAA Fence Company has been at the same location serving the local communities fencing needs. known across the southeast for our special events team. We travel to air shows, spring break events, and also work on and off the track at Daytona International Speedway. Here at AAA Fence we strive to provide the best fence installation experience for every customer every time. Proud of our craftsmanship and products, we offer a one-year warranty on labor, as well as a limited lifetime warranty on vinyl and aluminum products. We have been a member of the American Fence Association (AFA) since 1974. The AFA offers insight and information with frequently asked questions, which we will share with you. If you need a fence to last, AAA Fence Company is for you. Whether you want to keep your children and pets safe in the garden or get a little more privacy from your neighbors, fencing is important from both an aesthetic and security standpoint, so you definitely want your Orlando, FL fence installation done right. When browsing Orlando fence installers on Houzz, look for an experienced professional who has completed projects similar to yours and can provide insight and suggestions on materials and fence designs. Research your options prior to talking with a fence installer in Orlando, FL as you’ll have a better idea of what you want and need. Additionally, put together a Houzz ideabook with fence styles and designs that you want — this will help your professional turn your vision into a reality.